Home / personal fitness / Stay Competition Ready - FREE Summit For Staying Lean and Mean All Year Long! 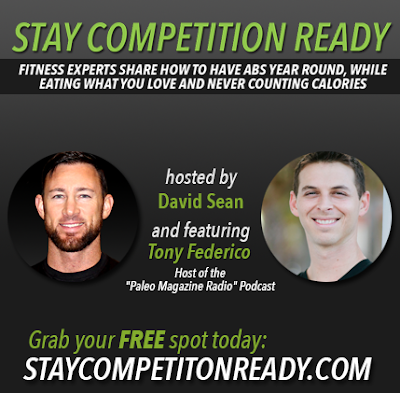 Stay Competition Ready - FREE Summit For Staying Lean and Mean All Year Long! Recently I spoke with Personal Trainer and Fitness Competitor David Sean. David invited me to join him for his "Stay Competition Ready" Video Summit and during our video interview, we dove deep into my personal strategies for staying lean and mean all year long, while working a full time job, while juggling multiple personal and professional commitments. The bottom line is that it IS possible to "stay competition ready" and we give it to you with no BS, just simple, effective strategies, that work. When you sign up for this free video summit at the link above, you’ll have access to interviews with all 21 experts, experts who are ready to show you how to take your body transformation to the next level. I hope you’ll join me and 20 other competitive fitness experts as we walk with you through your body transformation and share our typical day of eating as well as the importance of nutrient timing.